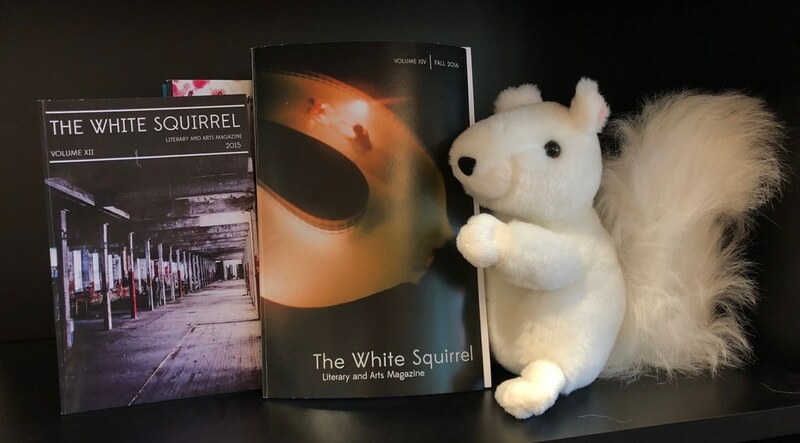 The White Squirrel is the University of Louisville Honors Program’s literary and arts magazine, which showcases the poetry, prose, art, and overall talent and creativity of our students. The magazine operates thanks to all the students who work on selecting, editing, and formatting submissions. Each semester, we host various events, including open-mics, which foster creativity within the community. You can look for the newest edition of our print magazine at the end of the Fall 2018 semester. Submissions for the sixteenth edition of The White Squirrel will open on November 1, 2018. Submissions may be sent to uoflwhitesquirrel@gmail.com. Please refer to the submission guidelines before submitting. For more information and to get involved, you can find us through Orgsync or Facebook, or email us at uoflwhitesquirrel@gmail.com. You can also find us on Instagram @uoflwhitesquirrel. The Fall 2017 - Spring 2018 Editors-in-Chief, Cat Sar (left) and Zofia Hetman (right).